NATURAL HABITAT AND PREFERRED SITE: Swamps, moist woods, and streams in east Texas or Houston area clays. It likes fully drained soils of the Pineywoods, Gulf Prairies and Marshes and other flood plain locations. 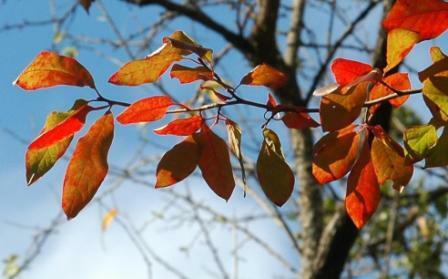 IDENTIFICATION INFORMATION: Black gum is a large, graceful tree with shiny foliage that turns a brilliant scarlet red in the fall. It has blue-black fruit that is normally left on the tree after the red foliage drops in the fall. FLOWERS AND FRUIT: The flowers are unisexual. Both male and female flowers are yellow or white forming in the early spring. Fruit is an elliptical blue-black fleshy droop that ripens in late summer through fall. BARK: It is gray to dark brown or black, deeper fissured on older trunks. FOLIAGE: Simple, alternate leaves that are shiny and dark green in the summer, brilliant red in the fall. Leaves are smooth edged and a little thicker than the rest of the leaf. The leaves range in length from 2 to 5 inches. CULTURE: Blackgum is a beautiful tree but unfortunately can only grow in sandy acid soils such as those of east Texas. Don’t even try to plant blackgum in alkaline soils. It needs moist soil year round for best results and is relatively slow growing. PROBLEMS: It cannot grow in the black and white or other alkaline clay soils of the state. PROPAGATION: By seed, cuttings or transplants. The seeds need to be sown immediately after collection in the fall or stratified for 30 to 60 days at about 40 degrees. The seeds should be kept moist in storage and after planting. Seedlings will benefit from partial shade. Black gum can be propagated from cuttings but it is not easy. Cuttings need to be taken in late winter and kept under a mist system. Percentage of success will be low. Transplanting is difficult because of the sandy soil locations. The best success will come from transplanting very small trees. INSIGHT: Nyssa also includes the East Texas Tupelo Tree. Nyssa aquatica is the water tupelo and Nyssa sylvatica var. biflora is the Swamp Tupelo. All these trees can grow to an excess of 100 feet tall in the right conditions. For more tree information read Howard Garrett's Texas Trees.